How old is Yoko Ono, what is her net worth and what has she said about John Lennon's murderer's ... . Beatles Radio: The Beatles, Solos, Covers, Birthdays, News The Fab 4 and More! The slain Beatle's wife has repeatedly said that Mark David Chapman should not be released after he shot the musician dead in New York City in 1980. YOKO Ono was the second wife of John Lennon and the couple campaigned for world peace together for years before he died. Here's the lowdown on the Japanese artist who stole the heart of the Beatles' legend. 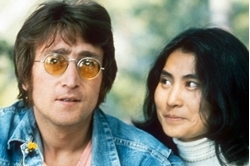 Yoko Ono was married to John Lennon for more than 10 years when he was shot and killed. Yoko Ono is 85-years old . She was married to John Lennon for over ten years from 1969 to 1980 when he was murdered in Manhattan. Together the couple had a son, Sean Ono Lennon, who was born in 1975. John and Yoko met in London in 1966 and married three years later in 1969. The Beatles broke up in 1970.